There are many people who do not understand cats. To understand them you have to be in tune with them. That means understanding every move, meow or flutter of the tail. In medical practice that saved my hands from getting bitten on a daily basis so I could perform surgery without grimacing from a bite wound to the hand. All I can tell you is that putting surgical gloves on a hand that was just bitten is extremely painful. Since I needed my hands for surgery every day, I had better understand cat behavior since most of them didn’t want to see me in the first place. Cat body language is totally different from dogs. You cannot treat cats like dogs or vice versa. They are completely different species! A simple example is the “expose the belly” position. I do not know one dog that does not like to have its belly rubbed. I often stooped down to pet a young puppy and the first thing it did was to fall to the ground and go spread eagle. It wanted its belly rubbed! Try doing that to most cats and you will not like the response. Usually, a quick slap with one of its paws or a “gentle” bite reminder that doing that is a no-no. 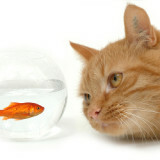 Some cats will tolerate it but watch for that little twitch of the tail as a warning sign. A lot of cats love to have the area right above their tail scratched or rubbed. It tends to put them into some sort of a psychotic state! Most will elevate their rear ends and prance around kneading everything in sight. Others will immediately begin licking the area like crazy; including your hand. I worked on one cat that spun around like a rotisserie chicken in a millisecond after scratching that area. Explaining cat body language can be accomplished two ways. The first is to explain the body parts that go into different cat moods and the second are descriptions of what makes a cat: happy, sad, anxious or mad! When it comes to cat body language the tail is one of the easiest to observe. All cats, except the Persian and Ragdoll, hold their tails upward at a perpendicular angle to their body. The Persian and Ragdoll hold their tail out in a horizontal line parallel to their body. A cat with its tail down usually indicates that it is scared of a situation. Cats that are happy with the world will usually walk with their tails elevated with a gentle fluttering back and forth. A cat that is standing, kneading and its tail fluttering like crazy means one of two things. It means that it is absolutely crazy about you or it is about ready to spray your $250 Gucci® dress shoes. I would prefer the former. A common cat body language tactic is just sitting doing nothing. That is what the cat wants you to think. A cat is always thinking. While you think they are exhibiting a blank stare they are actually figuring out the mysteries of the universe. If this sitting cat has a tail that is curled and fluttering around, it is annoyed at something! This could be due to an empty food bowl, the servants changed the brand of cat litter or someone decided to bring home a new puppy. Horrors! 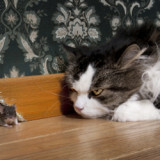 If that same cat is hunched up and its tail is fluffed up like a brush you had better stay away. It is mad! Cats employ their ears as living radar units. Because of their anatomical structure and muscles that control ear movement, cats can instinctively pick up sounds in any direction. Their position also determines what type of mood they are in. A cat that holds its ears in a relaxed position is a happy camper. 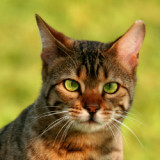 When a cat is on alert, or thinks it might feel threatened, those ears are erect and come closer together over the head. If that same animal becomes agitated those erect ears also flicker back and forth. A cat that goes one step further and is holding its ears back and down against its head is absolutely furious at something. Cat body language is also highly influenced by the positioning of the cat’s body. A cat that is splayed out on its back is in one of the most defenseless positions possible for a cat. This indicates that the cat is as happy as it can ever get. Everything is right with the world. An added bonus is positioning itself on its back in a southern exposed window allowing sun to shine on its belly. 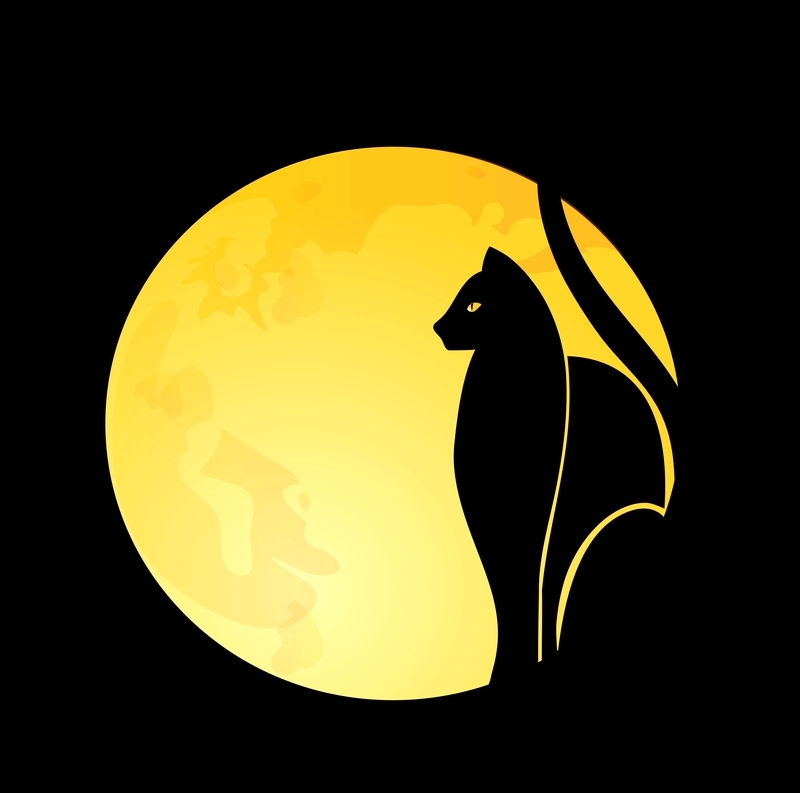 Many cats are like sundials and will follow the sun room to room as the sun crosses the sky. A lot of a cat’s life be it playtime or acting out fantasies revolves around being a predator. This is learned during early kitten socialization. Domestic cats are very similar to their larger cousins in the wild. They are true predator animals. At playtime, just watch a cat stalking a little, catnip stuffed mouse. From a distance it approaches it hunched with a body that is quietly slinking along getting closer to its prey. It produces an almost sub-audible chirp with its lower jaw rapidly going up and down. It than pounces, bites the toy and beats it up with its hind paws. The victim is now dead. The cat just won the battle. The hunched up cat can mean several things. The most common is the cat that is hunched up with a brush like tail. The cat is frightened. This is the typical black Halloween cat that we see every October 31. Cats that are cold and exposed to poor weather conditions will maintain a hunched appearance to conserve body temperature. This exposes less body surface to the cold which helps slow down heat loss from the animal. One of the most important hunching positions is when the cat is sick. This is crucial for all cat owners to recognize. A cat that is sick will stay in one place, hunched up and stay that way for hours. This means they are not eating, drinking or using the litter box. An immediate trip to the veterinarian is warranted. Do not wait. Cats love warm, breezy, sunny days. This gets them into trouble. They love to position themselves sitting on the base door plate of a exterior door that is half open. The problem occurs when wind causes the door to slam on the cat’s tail. I have treated countless of these poor creatures. The part of the tail below the injury usually has no feeling and must be amputated. This does not slow down the cat at all. They just look more and more like a Manx cat! Cats will also arch their bodies under certain situations. A cat with its back arched and hair up means that it is angry or scared. When the hair rests normally the cat is simply happy to see you. Cats that have suffered an injury to a lumbar disk or a sprain to the sublumbar expaxial muscle group will be presented with their bodies arched. This is called kyphosis. Studying or trying to interpret cat behavior by analyzing the eyes can be risky business sometimes. Cats that have dilated eyes and are hunched up with a brush like tail are angry to say the least. All animals, including humans, have to blink to remove foreign debris off of the surface of the cornea. This is performed by tear production and blinking. If you are sitting in a room and your cat is relaxed you will see it slowly blink at you. This means you are part of the house and I trust you! Blink back at your cat. It will appreciate it! Like people and dogs, cats also do not like being stared at. It makes everyone feel uncomfortable so do not do it to a cat. I think every human on the planet gets annoyed if someone is staring at them while eating a meal. Cats also do not like you staring at them while using the litter box. How undignified for an animal that thinks of itself as the cool of cool with every hair on its body in its place. This is common cat body language that means it is happy with itself and with you. This behavior is actually instinctive and neonatal. It goes back to the time of being a newborn kitten. Cats perform that act on their mother’s breast to facilitate the nursing process. Nursing is a happy event for a young kitten. It is nice and warm and close to its mother. This carries over into its adult relationships with its human family. I had a black cat up in Ohio that would climb up on my bed every morning and knead me while I was lying on my stomach. It was like getting a free massage. Cat body language is further complicated by the different sounds that the animal makes on a day to day basis. One of the most common sounds is the purr that cats make when they are happy or content. Cats also purr when they are in pain. 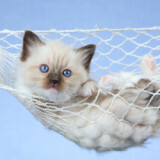 Purring helps relieve pain by the release of naturally made endorphins (the body’s own opiate). This analgesic response helps decrease pain. Cat body language also produces brief, little chirps intermixed between the meows. This chirping means follow me. Like follow me to an empty food bowl so you can see how starved I am that you feel bad and fill it back up again. Than there are the incessant howls that car drivers have to listen to when driving their cats to the veterinarian. Those are howls of distress. Cats hate car rides anyway. Have you ever noticed a cat stick its head into something than pull it out and it just sits there with its mouth half open and lips curled? Doesn’t it look goofy? It may look that way but cats have an extra olfactory device located on the hard palate between the upper canine teeth known as Jacobson’s organ. This allows a detailed specialized smell of what a cat might be interested in. In the wild, cats usually pick up pheromones in female urine this way. By opening its mouth, more of the smell is able to enter the mouth. Playful Mood- This mood has a predator ring to it. The ears are held forward, tail and rear end up, pounce the victim and declare it dead. Irritated- The pupils are dilated and the ears are held back against the head. The tail is usually twitching and there is a low pitched growl. 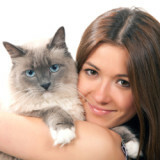 Cats may also put you on notice by gently biting down on your arm or fingers without force. This state can also be produced by hyper play. The cat gets so hyped up and wired that it gets so excited that it gets irritated. Go figure. This is true cat behavior and body language. Nervous- Very similar to irritated but the tail is down and the cat walks low to the ground. What it wants to do is disappear from the situation bothering it. Beam me up Scotty! Frightened- This is very easy to visualize. Just think of the black Halloween cat. Defensive- This is very similar to irritated and nervous but the pupils are dilated and there is a loud growl, hiss or meow heard. This behavior is seen in people except we do not growl or hiss. Being irritated and nervous can make anyone feel defensive. Mad/Angry- You do not want to be around a mad, angry cat. I have seen this behavior too many times. Imagine having a job where you have to actually get this cat out of a cat carrier to perform a physical exam. The ears are back and the pupils are dilated. The tail is rapidly going back and forth and the animal is hissing, spitting and or growling plus urinating and defecating at the same time. Most people do not have to confront this cat body language. It is most commonly seen in tomcats staring each other down in preparation for a fight. Cats usually like to broker a settlement or peace treaty but fights do happen.